A journey of bits and pieces right through the Northeast Monsoon 2016 season. Only 3 phases that could possibly mentioned in terms of events so far since the onset of Northeast Monsoon pretty much sums up the year. Only 6 days out of the 66 days of the season so far has seen above average daily rainfall. The two cyclones contributing 3 days among them while the onset phase gave us a day. Its an irony that 2 of the 6 above average days came even before the onset of NEM. With only 4 mm needed to reach the lowest rainfall ever, 163.5 mm in 1876, 2016 may not end up as the Worst Northeast Monsoon in 150 years. Having said it could possibly end up as the worst Northeast Monsoon in a 100 years with still another 35 mm needed to cross the rainfall recorded in 1938 which is the worst year in the last century. One another record which 2016 could end up setting is possibly becoming part of the 5 worst Northeast Monsoon Years for Tamil Nadu since maintaining records were started. 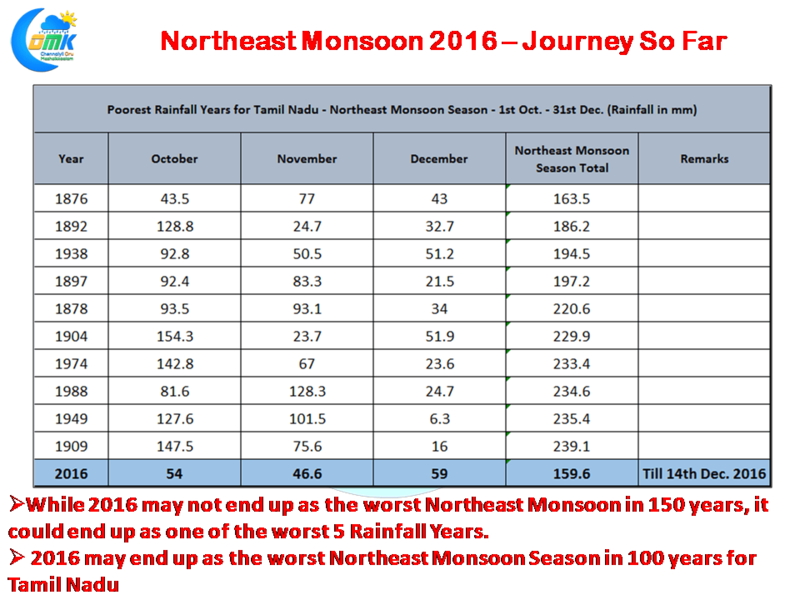 Will 2016 become the worst year in a century and get into the books as one of the Worst 5 Rainfall Years for Tamil Nadu? Lets Hope Nature has some other thoughts.